Today was again east and then south on our way home, since we had stopped at a few pubs on this trip we decided we would follow the “Outback Pubs” brochure we picked up in Charleville and see a few of these characters shown in the brochure. The Walkabout Creek had been one of those pubs, and we looked forward to seeing a few more. We got our earliest start yet and were well on the road by 7 am; we had our breakfast at Kynuna some seventy kilometres east of McKinlay and carried on to Winton a further 200 kilometres eastward for coffee. It was too early to take in a pub, so we continued southeast to Ilfracombe about 30 Kilometres from Longreach. Ilfracombe has a great little pub, and although they didn’t do lunch they had a wonderful feel for the local history and the walls were full of some very interesting stuff. We stayed for a couple of pots before moving on. We had decided to go directly south from here on a little used road on our way to Blackall for the evening via a place called Isisford which had a pub listed in our book that looked worth checking out. This little sealed back road turned out a real joy to drive; it is nearly flat, and as we headed directly south along it we saw all kinds of wildlife on the road. We’re headed for the pub Clanceys Overflow, it seems that the Banjo Patterson’s poem Clancey of the Overflow was the inspiration here. 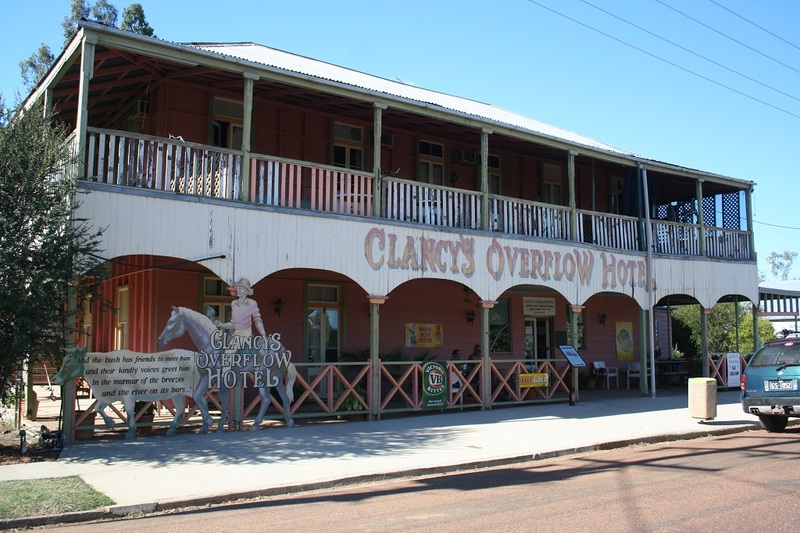 Isisford is very small but did boast two pubs, we stopped outside Clanceys. There were a couple of people sitting outside having a lazy Sunday afternoon drink in the warmth. 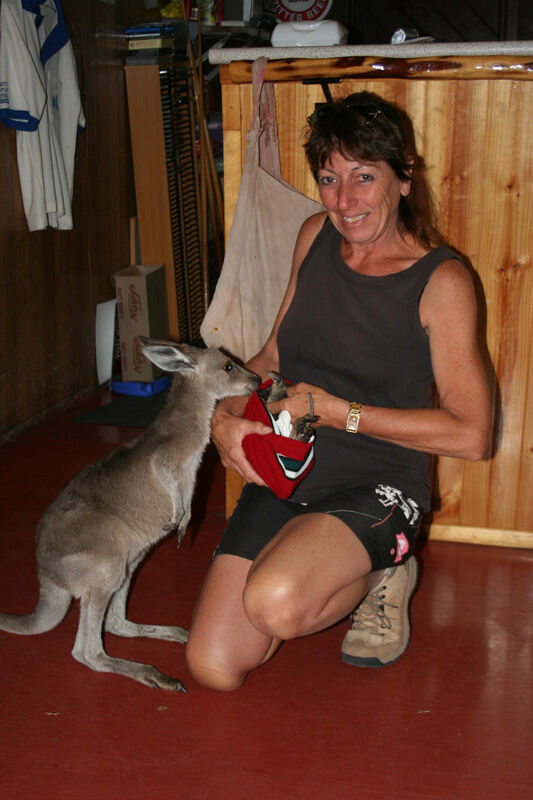 There, standing beside her was a two foot high baby Grey Kangaroo, she was just hanging around in the bar. The bar tender said the ‘roo was picked up as a baby after her mother became a road kill statistic. We were going over to see this young lady when the bar lady went back behind the bar. She came out with a fabric shopping bag, which had in it a beanie and inside the beanie was a baby Wallaroo. This little guy was tiny, and had simply been hanging around in a bag on a hook by the bar, while she worked behind the counter. We spent a long time there talking to her about both these guys, both orphaned as the result of road kill. She and her daughter were looking after them. It appears her sister had some background in caring for wildlife and had advised her on how to mix the right formula for feeding her new family.We took some pictures and promised we would send them on to her before heading southeast to Blackall. We spent the night at the Barcoo Hotel in Blackall, and you guessed it, this pub was in our pub book. We got a reasonable room with shared facilities for very little and enjoyed a good night in the pub which featured a Chinese meal this evening.